An air mattress with a cot? I have reviewed quite a few air mattresses but one airbed that really caught my attention is the Coleman Queen Cot with Airbed. If you have been looking for an easily portable yet most comfortable camping bed that stays off the ground protecting you from cold, damp surface and also from the fear of insects creeping onto your bed? Then Coleman Airbed Cot Queen with Side Tables and 4D Battery Pump will perfectly serve your purpose. It is the best self inflatable air bed for camping. Cot and mattress when separately used provide sleeping space for 4 persons. Both the cot and the air mattress are made from durable material and it comes at an affordable price. The best and the most appealing feature of the Coleman cot with air mattress is its design. Yes, it’s designed primarily for both indoor and outdoor use. By spreading the airbed cot with inflated mattress and placing the cup holders on the sides, you can experience your regular home bed like comfort even when you are camping outdoors. Or you can rather separate the air mattress from the cot and get double sleeping space. While you sleep on the mattress, your kids or camping partners can sleep on the cot. 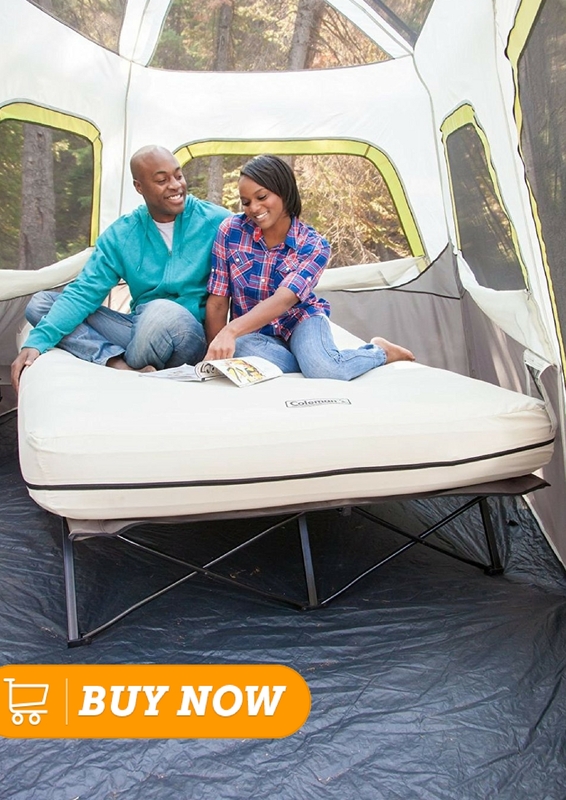 The Coleman Queen Airbed is extremely comfortable. The first feature that makes it comfy is the ComfortStrong Coil Construction. Coleman Queencot with Airbed employs ComfortStrong coil construction that provides perfect firmness and even sleeping surface across the entire mattress area. Coil construction offers stronger support than any airbed using channel construction. The difference between channel and coil construction in air mattresses is that in channel construction unwanted bulges might pop out from any place in the mattress owing to the asymmetrical air pressure levels when the air mattress is fully inflated. These bulges are vulnerable to punctures or can poke your back if they happen to show up on the top sleeping surface. Whereas in coil construction, there are these air coils that run inside the entire length and breadth of the mattress. These air coils hold the top and bottom surfaces together without leaving scope for any pop ups or uneven bulges even when the mattress is fully inflated to its maximum firmness level. Coil construction provides perfect support, desired firmness and even weight distribution across the entire sleeping surface without resulting in unwanted drifting or sagging of the mattress. The most bothering thing for me when I go on camping with family and friends is the fear of insects creeping onto our bed when we are dead sleep after a tiresome day. What if my kid’s bitten by any of those insects? This very thought was the biggest fear at the back of my mind whenever I had been to camping. Most of us prefer air mattresses with raised height. They stand around 18 inches above the ground giving the perfect regular bed kind of feeling. It makes getting in and out of the bed pretty much easy and in a way relieves pressure off your knees and back owing to its regular home bed height. But finding an air mattress with raised double height for outdoor purpose is a tad difficult task. Even if you happen to find this kind of height in other air mattresses, it would be difficult to carry them for camping or outdoor use owing to their excessive weight. Most importantly, in order to inflate such a raised double height air mattress to its maximum height of 18 inches or 22 inches, you need to have a powerful internal pump that runs only on built-in AC pumps. Isn’t it kind of difficult to use such beds for camping as it’s near impossible to expect an AC power source while outdoors? But here lies the advantage with Coleman airbed cot. You can place the mattress on the cot and enjoy a comfortable sleep while sleeping at a height of 22 inches above the ground. Yes, 22 inches above the ground with the cot plus another 8.5 inches with air mattress fully inflated, perhaps, no other mattress offers such a height advantage. And this is the very reason Coleman airbed with powerful external 4D battery pump will perfectly serve the purpose and should definitely be your preferred choice. The cot height also allows you to place your belongings, camping gear or other large stuff beneath the frame. If you would rather love to sleep just a few inches above the ground, then you can place the mattress on the sleeping floor and lend the cot to someone else to sleep on. This way you can avail double sleeping space for the cost of single airbed. In addition, if you are on a hiking trip where carrying the cot and mattress might be somewhat heavy. Then just leave the cot behind, pack the deflated air mattress with the pump and set off for a happing hiking. Coleman cot air mattress comes with a 4D battery pump. From user reviews we found that the battery pump is so powerful that it inflates the mattress to its full capacity within 2 to 3 minutes. The other feature that builds on the comfort level of this airbed is the double lock valve. The mattress is made from Airtight system that involves Double Lock Valve for easy inflation. Just connect the 4D battery pump to the double lock valve for inflation and disconnect when you reach the desired firmness. And the airtight system that is factory tested along with the double lock valve holds the air all night without leakage. User reviews reveal that overnight air loss complaints are virtually nonexistent with this Coleman airbed. The only time that the mattress needs re-inflation is when you inflate it for the first time as the PVC material stretches a bit when used for the first time. If you want an airbed that is versatile and durable, pick this one. 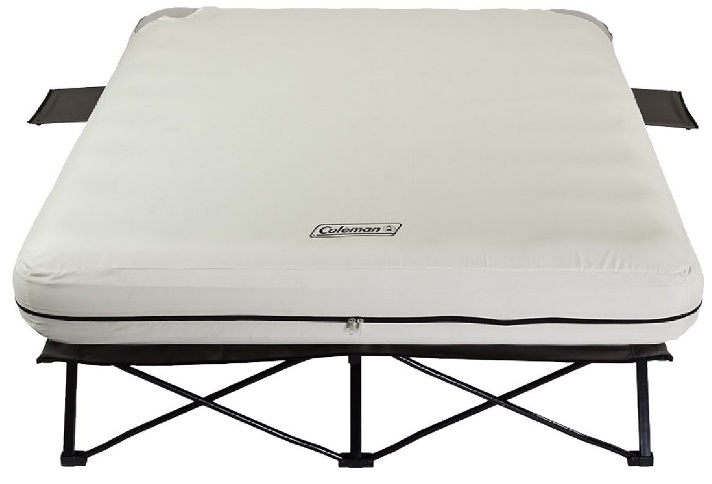 Coleman Queen Airbed frame is made from durable steel and it can support weights up to 600 lbs, that means even two people can comfortably sleep on it. All you need to do is just use and store the bed as instructed in the manual, and we assure you it will last for really long time. From user reviews, the steel frame is so strong that it survived on uneven terrains and camping grounds, remained perfectly sturdy and all without the steel frame making any unruly noises. The sheet on top of the frame is made from canvas material and a thin cotton sleeve with zipper is permanently stitched to the frame’s canvas sheet. When the mattress is slid into this sleeve and zipped closed, the frame perfectly holds onto the air mattress and doesn’t allow it from sliding or drifting sideways. There is a steel bar that runs through the middle of the cot. So, one person occupying the entire area without the mattress on it might be left to choose either of the sides for a comfortable sleep. But would be greatly beneficial if there are two people sleeping on the empty cot, they can occupy both the sides without any issues. So, all in all, when the mattress and cot are separated, four people can comfortably sleep on them, two on the cot and two on the mattress. The entire frame is foldable and easily fits in the large size carry bag along with the deflated air mattress and 4D battery pump making it ideal choice for outdoor use. Additionally, the carry bag is wheeled making it easy to stroll around without much physical effort. And in case you are in a hurry and need to do fast packing, then the best thing to do is fully deflate the air mattress while it’s still inside the cotton sleeve and fold the frame back as is without the need to pull it out. The side tables have a mesh cavity, designed to hold water bottles and cups. The size of these side tables is decent enough to even place books, mobile or other small items. These side tables are detachable and have to be hooked to the frame if and when you intend to use them. The air mattress itself is PVC made and allows stretching. Few hours before using it for the first time, inflate it to its full size, sleep on it for a while. This way the material stretches and opens up for additional air to reach its full air capacity. The PVC material is durable and safe to sleep on as the mattress is zipped inside the cotton sleeve, thus eliminating the worry about the downside of sleeping on PVC material. In case you are using it separately, then better to have a queen size cover over it. Although the mattress doesn’t have flocked top but the interior construction is coil based and distributes weight evenly across the entire sleeping surface without the scope for sinking, sagging or drifting. What's the height and weight of the mattress? Coleman air mattress cot stands at 22 inches above the ground after the steel frame is setup ​with an additional 8.5 inches of fully inflated air mattress height. The cot and the mattress put together in the carry bag weigh around 40 pounds. Does the mattress come with built-in pump? Yes, the Coleman airbed pump​ is 4D battery powered that helps in both inflation and deflation of the mattress.However, the batteries need to be purchased separately. Does the mattress come with a carry bag? The coil craftsmanship creates a bulge-free, even sleeping surface that supports your back. It is completely sealed with airtight valves. Thus, the bed stays firm all through the night. It is a classy bed that provides side tables with cup holders. It is heavy for a serious adventurer, hiker and camper. Replacing Coleman in case of any issues might take around a month. But you really need not worry as the product is released after factory testing to check for air leakages. This product provides a 1 year limited warranty. Like in case of every other mattress, the best thing to do when you receive it is to test it before storage. Otherwise, if you remove it the day you plan to go camping or when you have more guests than you can host, and if you notice any issue then that might spoil all your plans. As a result, I would recommend checking and inspecting yours when it is delivered. This will give you enough time to file a complaint and get a replacement. Concerning Coleman’s customer care service, complaints against their products or their customer service are negligible. Coleman responds fast to customers’ questions. But don't expect it replace an item that is returned after the warranty period is over. 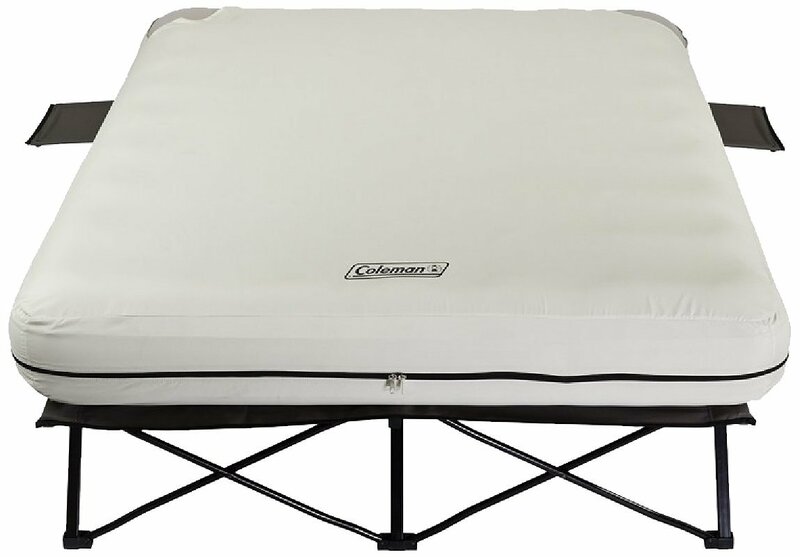 The Coleman Queen Airbed Cot with Side Tables and 4D Battery Pump is a great product if you are looking to do local camping expeditions. Double space plus powerful 4D battery pump with double lock valve, easy setup of both bed and cot and a 1 Year Warranty, all make it a great buy.